Copper has existed on earth since the birth of this planet, which is an essential element for creatures because of its special chemical property and function. Besides, as a critical material, it has been utilized by human for a long time as large amount of copper is mined, processed and applied to our life. However, many a "copper-made" is abandoned nowadays, which leads to the accumulation of copper ion in fresh water and other places, resulting in jeopardizing the copper cycle on earth. Once the concentration reaches a high level then it will become destructive and cannot be cleared by ecosystem itself, causing the phenomenon what we called “copper contamination”. Copper is indispensable for life. Generally, the chemical property of copper was embodied by transformation between its redox states, Cu（II）and Cu（I）.The redox potential Cu（II）/Cu（I）determined copper can easily oxidized some substrates such as superoxide, phenols  .And that’s why several enzymes involving in some vital processes such as photosynthesis, respiration adopt copper to transfer electrons. Moreover some arthropods and molluscs even utilizes a kind of copper protein, hemocyanin, to deliver deoxygen instead of known hemoglobin. Today, from a spoon to a skyscraper, the uses of copper is extending everywhere. 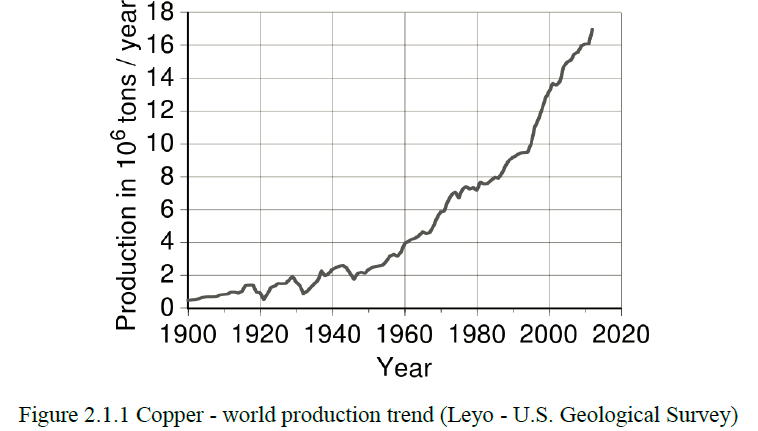 For meeting the increasing demand of copper in the world, the massive copper ores are mined every year [Figure 2.1.1]. 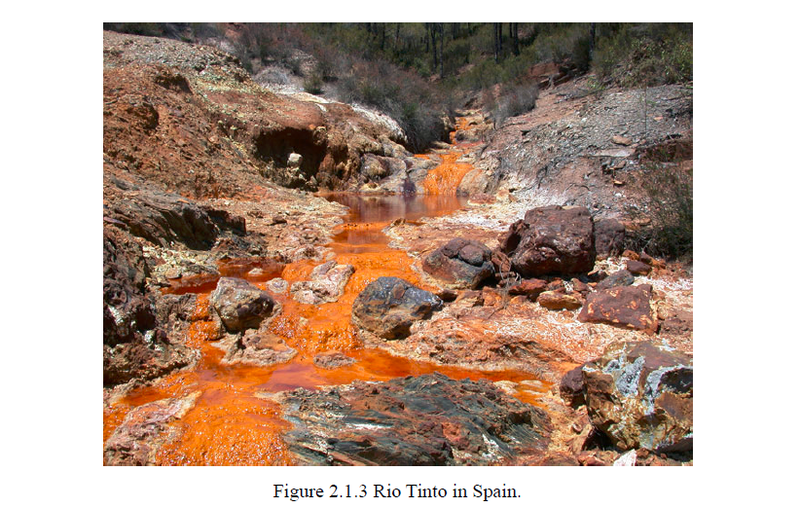 And most copper is mined as copper sulfides such as chalcopyrite.Those type of mines are more likely to produce acid mine drainage (AMD) which refers to the outflow of acidic water from metal mines or coal mines [Figure 2.1.2]. The ferrous iron (II) generated from oxidization of pyrite is oxidized to ferric iron(III). And another process happens simultaneously with oxidization of pyrite and need to be catalyzed by microbes. 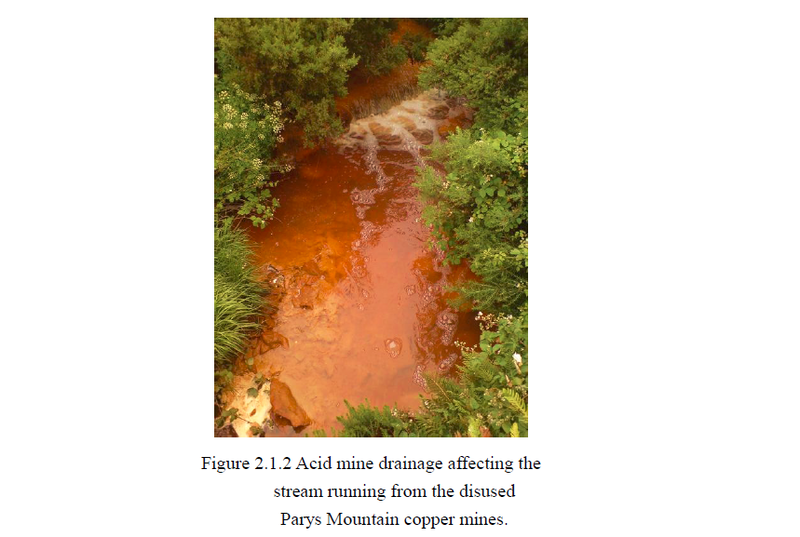 Those reactions jointly lower the PH of water and produce soluble ferric iron(III),and finally the acid mine drainage emerges [Figure 2.1.3]. Associating with water and air, the metal mines where the ore is sulfide mineral or comprises pyrite can easily produce the highly acidic effusion. Usually the predominant metal ion isn’t iron but copper, zinc. The most common ore mined is chalcopyrite which is a copper-iron-sulfide and occurs with a range of other sulfides. Thus, copper mines are primary crime of AMD. But there is an exception, Escherichia coli ,which has several sophisticated and powerful systems to maintain the copper homeostasis so it can survive in skyhigh concentration (Look at our MIC(minimum inhibitory concentration, MIC)experiment) . Basing on this characteristic of E.coli, we start to design an bio-machine to solve the problem of copper contamination effectively. Rensing, C., & Grass, G. (2003). Escherichia coli mechanisms of copper homeostasis in a changing environment. FEMS microbiology reviews,27(2‐3), 197-213. All Pictures come from Wikipedia.